Let us tell you a little secret. Wherever you travel, trying to blend in is a good idea. It may not always be possible, as you visit a country inhabited by a different race or just the opposite complexion to yours, but it is always valuable. But let’s get back to it in a minute. Have a moment and bring yourself back to the place you visited the last time. Was it comfortable to step out fro touristic spots, hotel, airport, and walk right into the crowd of locals? How did you feel? Were you watched, or were you blending in like a chameleon? Whether you are visiting Stockholm in Sweden, Copenhagen in Denmark, or Oslo in Norway, or Helsinki in Finland, or Tallinn in Estonia, there is a certain way people communicate, appear and respect each other. To blend in is hard; the least you can do is to appear less different just walking by. Why Should you Blend in? If you ever visited Islamic countries as a woman, you will know. If you ever wore a white dress to someone’ s wedding, you will know, too. There are unspoken rules on people’ s manners, and attitudes arising from not following those rules. For travelers, it is certainly advisable to blend in, not only for better treatment but also for safety and respect. First, you will not be stared at. It feels good, trust me. You will be able to walk the street without feeling anxious and out of the place. You will be able to get closer to locals, not bringing all the attention onto yourself. Second, you will be safer and the chances of getting pickpocketed will decrease. If you are wearing khaki shorts and a baseball cap in Milan, it is a sure proof you’ re American, and thus a clear target for pickpockets and scam artists. Especially, if you are going to swim in the sea on Barcelona beach and hope no one takes your phone in meanwhile. Third, you will show respect to locals, and in return be more respected yourself. It means locals will treat you better, from not trying to rip you off at farmers’ markets and not giving you catcalls on the street. First things first, North is all about the minimalism. Less color, fewer prints. You will not see locals walking with red scarves around their necks, or wearing sparkly dresses in the daytime, unless you visit Copenhagen during the fashion week, of course. Go with a washed and less attention-grabbing look, yet nothing too baggy. In Europe, people favor fitted clothes, and it is generally not an exception for Northern Europe, either. We understand. You may not always know where the statue is located, or what side of the central market stall did I just enter from. Relax. Only use your Google Maps when you absolutely have to. Remember the route and.. Off you go! Catch a glimpse of the sites, rooftops and the beautiful Nordic Art Noveau, but beware the wandering tourist look. It gives off too much. Northern Europeans are not Southerners, nor do they speak as loud as Americans do. Keep your voice low, and you will see how much less attention and looks you get. As for English, locals speak the language perfectly, but still, you should learn Hej, Tack and Tilgi (Hi, Thank you, and Sorry in Danish, Swedish and Norwegian) to show respect and not to have an instant tourist badge. We hope your next trip to Stockholm, Oslo or Copenhagen will be awesome! Just remember that it is in your good to acts as a local. 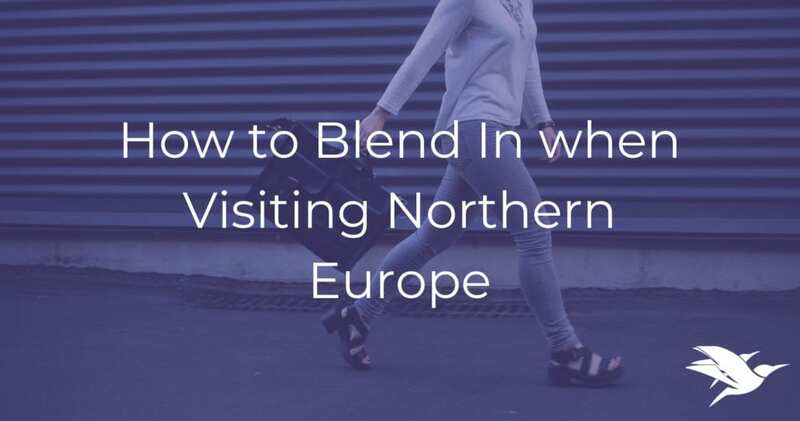 Not only you will get less unwanted attention, but you will also respect locals, keep it safe and get a chance to enjoy the authentic vibes of your Northern Europe travel destination.